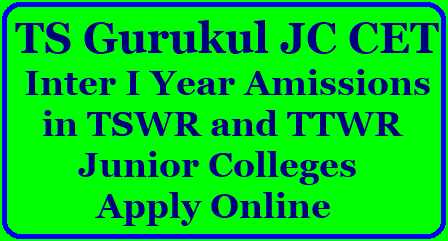 Telangana Social Welfare Residential Educational Institutions Society (TSWREIS) has issued the TS Gurukul RJC CET 2018 notification on April 22, 2018 for intermediate 1st year admissions in TTWR and TSWR Junior Colleges in Telangana for the academic year 2018-2019. The TSWREIS officials are inviting the online application forms from the eligible SSC passed Boys and Girls for admissions into Junior Intermediate into 127 TSWRJC and 49 TTRJC Institutions in the State. The following are the instructions to apply for admissions. Date of Examination: 28 .05.2018 from 10.00 AM to 12.30 PM. b) The students should apply within his / her own district. e) If the group desired by the student is not available in the same district, the student can apply in other district of the same Zone. g) The annual income of the parent shall not exceed Rs.2,00,000/- per annum, which should be as certified by MRO. h) The age of the students shall not exceed 17 years as on 31.08.2018 and in case of students studied in Social Welfare Residential Schools and Social Welfare Hostels relaxation of 1 year will be given. i) The students should produce Caste and Income certificates certified by the M.R.O. 1. Providing quality education on Residential mode. 3. Loco parent system is implemented to look after and guide the student. 4. Day starts with the Physical exercise and classes will commence from 7:30 a.m. and the academic activities will continue till 9:00 p.m.
5. Apart from the academic activities, importance is given to Sports and Games and other Co- curricular activities for all round development of students. 6. Medium of Instruction will be in English only. 7. For meritorious students, the summer coaching camps will be conducted for EAMCET, NEET, IIT, CA- CPT and CLAT. 1. There are good infrastructure facilities in addition to well equipped laboratories, Libraries, reading rooms and play grounds. 2. The Colleges offer free boarding and lodging to all the selected candidates. 3. Special care will be taken for talented and future learners. 4. Bedding material, Uniform and Note books are given at free of cost. candidate. Candidates who have passed in earlier years are not eligible and need not apply. TSWR and TTWR schools in the district based on applications received. Question paper shall be issued in Telugu/English (bilingual) only. Test will be conducted in Objective type (Multiple Choice) for 150 Marks (30 marks each for English, Maths, Physical Science, Bio-Science and Social Studies irrespective of groups. The duration for the test is 2½ hrs. Syllabus for subjects and English will be General English. Candidates can submit the online applications through online mode @ http://tsswreisjc.cgg.gov.in/. For all details visit www.tswreis.telangana.gov.in or http://www.tgtwgurukulam.telangana.gov.in/ or contact any of the nearby TTWR /TSWR School /Jr. College in the Region. i. The candidate shall first go through the information bulletin carefully and satisfy their eligibility for appearing for GURUKUL JC-CET 2018.
ii. The candidate after satisfying himself/ herself about the eligibility criteria for the submission of application through online should pay a fee of Rs.100/- through ONLINE or through Credit card (Payment gateway ) from 23.04.2018 to 07.05.2018 for submission of application through Online. Test will be conducted in Objective type (Multiple Choice) for 150 Marks (30 marks each for English, Maths, Physical Science, Bio-Science and Social Studies irrespective of groups. The duration for the test is 2½ hrs. Spl category Reservation: PHC: 3% within community quota. Spl. Category Reservation i.e., PHC 3% and Sports Quota 3% within ST community. When will the selected candidates list for second counseling be released?